My career shift just keeps getting better. 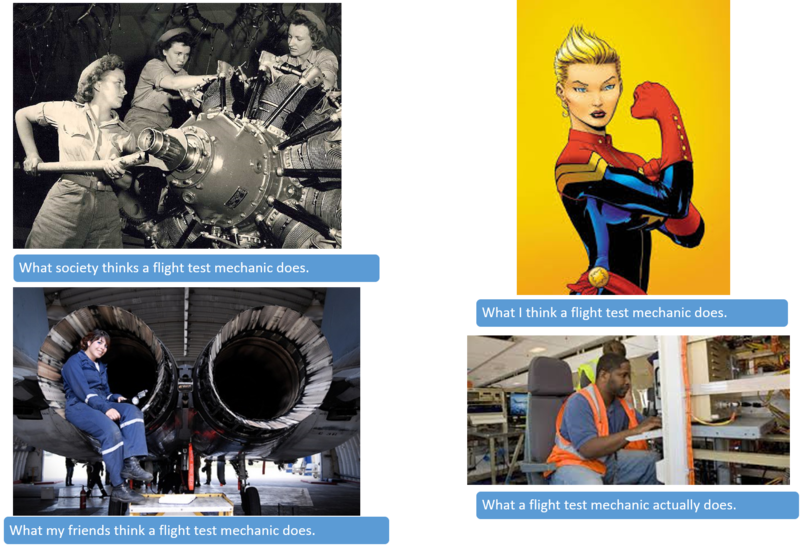 This week I’ll be talking to a flight test manager at Boeing, so I can learn more about the role of flight test mechanic, get an idea if that’s truly a career path I’m interested in, and, if so, find out more about the career roadmap that will get me there. I’m really excited about this. I promise I’ll update this post after the meeting, when I have something to report. In the meantime, I think my perception of the role is kind of like that meme that was going around a year or two ago, about how different people perceive particular jobs. (6/12/2014) OK, I had my meeting and learned some new stuff. The good: it’s one of those jobs where you do something new every day, based on the list of exceptions you get from the pilots and engineers; you get to be around the cutting edge airplanes a lot; you get to go to exotic locales when the plane is being tested for a particular climate. The only downside I heard was that mechanics don’t get to go on the test flights – that’s reserved for the pilots and engineers. So, either an engineering degree is in my future, or I let that idea go. I also learned that I’ll need at least 5 years in the field before I would be considered eligible for a career in flight test. This is about what I would have expected – the education I’m receiving now is a great foundation, but there is still a whole lot to learn, and the only way to do it is to put in the time. Time spent working on airplanes, quite possibly for a commercial carrier. Nothing wrong with that – that would be a dream come true all in itself. As I get closer to the end of my schooling I’ll continue to explore the various career options, and I’ll continue to post about what I learn. Who knows, maybe in addition to being entertaining, it will be helpful to some of my classmates. Jennifer, this is awesome! And I am in SLC. Heading to Paris today. Scheduling called and will miss the events as the Museum today. But you have GREAT news. Your endeavors certainly seem to be paying off in a very big way! Glad to hear your positivity in all the learning kerfuffle and apparently you have made all the right choices! Great news, Jenn!